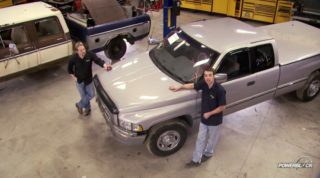 Extended 'Coma Part 1: New Timing Belt & Stock Test Drive : Trucks! We start Project Extended 'Coma with a 2000 Toyota. Extended 'Coma Part 2: Adding a Turbo! We're adding a turbo to our 2000 Toyota Tacoma. An offroad test for our Wranger LJ and Project: Extended 'Coma. (ANNOUNCER)>> TODAY WE'RE STARTING A BRAND NEW PROJECT. FIRST WE'RE TUNING UP OUR NEW TO US TACOMA. THEN WE'RE TAKING IT OUT FOR A LITTLE TEST DRIVE. WE WANT TO FIND OUT JUST HOW TOUGH THE BASE TO OUR NEW PROJECT REALLY IS. IT'S ALL TODAY HERE ON TRUCKS! (KEVIN)>> HEY GUYS, WELCOME TO TRUCKS. WELL WE TOLD YOU A WHILE AGO WE WERE LOOKING FOR A TOYOTA TACOMA AS A PROJECT VEHICLE. IT'S A ROCK SOLID PLATFORM BUT THERE'S STILL ROOM FOR SOME IMPROVEMENT. NOW WE'VE BEEN HOLDING OUT, WAITING FOR JUST THE RIGHT TRUCK, AND WE FINALLY FOUND IT. ALTHOUGH IT'S ACCESSORIZED A LITTLE DIFFERENTLY THAN WE NORMALLY WOULD, IT STILL HAS SOME OF THE OPTIONS THAT WE HAD TO HAVE. 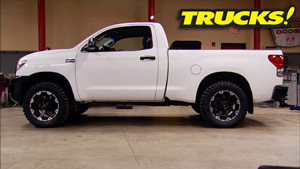 (RYAN)>> AND HERE'S WHAT WE'VE BEEN HOLDING OUT FOR, A TACOMA WITH THE TRD OR TOYOTA RACING DEVELOPMENT OFF ROAD PACKAGE. IT INCLUDES THIS ULTRA COOL STICKER, SOME UPGRADED BILSTEIN SHOCKS, AND MOST IMPORTANTLY AN ELECTRONIC LOCKING REAR DIFFERENTIAL, WHICH WILL SAVE US BIG BUCKS AND PREVENT US FROM HAVING TO UPGRADE TO A LOCKER IN THE REAR AXLE IN THE FUTURE. NOW WE MIGHT HAVE TO ADD ONE UP FRONT, BUT THAT'S A WAYS DOWN THE ROAD. 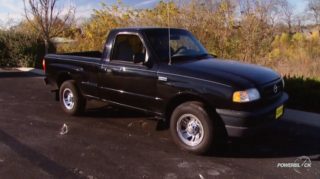 EITHER WAY THIS FACTORY INSTALLED OPTION MAKES THIS LITTLE PICK UP TRUCK A SOLID AND CAPABLE PERFORMER RIGHT OUT OF THE BOX. (KEVIN)>> NOW THE TWO WHEEL DRIVE PRERUNNER TRUCKS ARE AVAILABLE WITH THE TRD PACKAGE BUT YOU CAN INSTANTLY RECOGNIZE A FOUR WHEEL DRIVE BY THE SIX LUG WHEELS. NOW THE TIRES ARE BRAND NEW MICKEY THOMPSON MTZ'S, WHICH ON A USED VEHICLE SOMETIMES CAN MEAN THAT THE PREVIOUS OWNER WAS TRYING TO COVER SOMETHING UP. NOW THE DUAL EXHAUST TIPS, WELL NICE TRY BUT... ( buzzer sound ) THEY'RE GOING AWAY CAUSE THEY DON'T SOUND VERY GOOD EITHER. NOW INSIDE THE FAIRLY WELL USED BED IS A RUBBER MAT AND THIS COOL TOOL BOX, WHICH WE ACTUALLY GOT THE KEYS FOR. SO IT'S STAYING AROUND. NOW THE SAYING GOES, WITH A USED VEHICLE, YOU BUY YOUR MILEAGE. 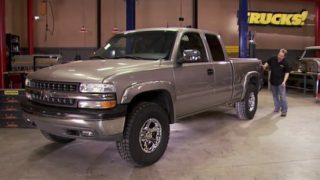 WE GOT A PRETTY GOOD DEAL WITH THIS TRUCK BUT IT COST US IN MILEAGE, 179,000 MILES ON THE CLOCK. 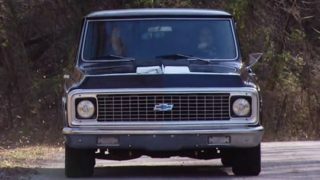 HAVING SAID THAT, THE INTERIOR IS IN REALLY GOOD SHAPE, ESPECIALLY CONSIDERING THE AGE AND THE MILEAGE, AND THIS TRUCK COMES EQUIPPED WITH ALL THE COOL BELLS AND WHISTLES TOO. SUCH AS THIS CLUTCH BYPASS SWITCH, WHICH ALLOWS YOU TO START THE VEHICLE WITH IT IN GEAR. IT COMES IN REAL HANDY IF YOU'RE STALLED ON A STEEP HILL. YOU'VE ALSO GOT YOUR TYPICAL AMENITIES LIKE CRUISE CONTROL, A NICE STEREO SYSTEM, AIR CONDITIONING, AND A DEFEATABLE PASSENGER SIDE AIR BAG, AND CUP HOLDERS. NOW THERE ARE A COUPLE OF ITEMS THAT ARE QUITE VISIBLY WARN. 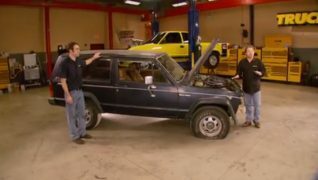 HOWEVER, THE CARPET'S IN NICE SHAPE, THE SEAT UPHOLSTERY'S IN DECENT SHAPE, AND THE HEADLINER, WELL IT'S NOT HANGING DOWN. SO OVERALL WE'RE HAPPY WITH THE CONDITION OF THE INTERIOR. NOW AS FAR AS THE PAINT AND BODY, WELL IT'S NOT SO BAD EITHER. 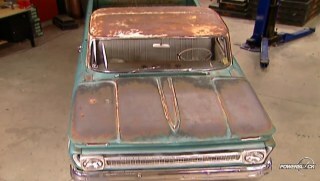 (RYAN)>> NOW LIKE KEVIN SAID, THIS PICK UP HAS NEARLY 180,000 MILES ON IT. THAT'S NO BIG DEAL. 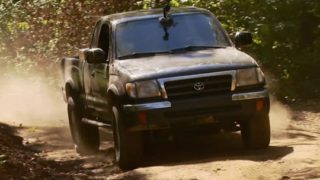 TOYOTAS HAVE GAINED QUITE THE REPUTATION FOR BEING DURABLE AND LONG LASTING IF THEY'RE MAINTAINED. SPEAKING OF WHICH, WELL THE PRIOR OWNER KEPT DETAILED MAINTENANCE RECORDS IN THIS LOG BOOK OF OIL CHANGES, OTWO SENSOR REPLACEMENTS, BRAKE WORK, YOU NAME IT, IT'S IN HERE. IN THE GLOVE BOX THERE WAS ALSO A STACK OF RECEIPTS FOR ALL THE WORK DONE, BUT NOWHERE IN THIS LOG BOOK OR IN THIS FIST FULL OF RECEIPTS IS THERE ANY RECORD OF THE FACTORY TIMING BELT HAVING EVER BEEN REPLACED. AND AS ANXIOUS AS WE ARE TO TAKE THIS TRUCK OUT AND SEE WHAT IT CAN DO, WE'RE NOT GOING ANYWHERE UNTIL WE PUT A NEW TIMING BELT ON THIS THING. UNDERNEATH THE TRUCK, IT'S RUST FREE AND PRETTY CLEAN. AND LIKE WE TOLD YOU, THE REAR AXLE'S AN OPEN DIFFERENTIAL UNTIL YOU ENGAGE THE ELECTRIC REAR LOCKER. NOW THE PREVIOUS OWNER HAD SOME MUFFLER SHOP DUAL EXHAUST SYSTEM INSTALLED THAT WE'LL EVENTUALLY REPLACE. NOW DURING THE INITIAL TEST DRIVE WE NOTICED SOME DRIVE LINE VIBRATION. THAT'S DUE TO WARN OUT UJOINT AND A REALLY WARN OUT DRIVESHAFT CARRIER BEARING. NOW THE FRAME IS STRONG. IT'S FULLY BOXED ALL THE WAY BACK TO THE FRONT SPRING HANGER, AND THE GAS TANK AND TRANSFER CASE HAVE FACTORY INSTALLED SKID PLATES. NOW AS FAR AS THE FRONT END GOES, WELL I'VE GOT A REALLY WARN OUT INNER TIE ROD END, AND IT PROBABLY KILLED THE LAST SET OF TIRES, AND IT'S PROBABLY THE REASON THE SELLER THREW ON A FRESH SET OF RUBBER. NOW THE INDEPENDENT FRONT SUSPENSION LOOKS OKAY. WE'VE GOT A LITTLE BIT OF A HALF SHAFT SEAL LEAK OR DRAIN PLUG LEAK, BUT WE'RE NOT SURE HOW LONG THIS INDEPENDENT FRONT SUSPENSION'S GONNA STAY IN HERE ANYWAY. SO WE'RE NOT GONNA WORRY ABOUT THAT A WHOLE LOT. AND THE FACTORY FRONT SKID PLATE'S LONG GONE, LEAVING OUR RADIATOR AND ALL THESE SUSPENSION COMPONENTS EXPOSED. 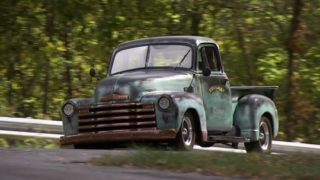 SO WE'LL HAVE TO TAKE CARE OF THAT AS WELL, BUT OVERALL THIS TRUCK'S IN GREAT SHAPE, ESPECIALLY CONSIDERING THE MILEAGE. NOW THE FIRST STEP IN THE INSTALLATION OF THE TIMING BELT IS TO DRAIN THE COOLING SYSTEM. WE ALSO REMOVED THE CHROME PUSH BAR TO GIVE US A LITTLE BIT BETTER ACCESS. WE ALSO REMOVED THE UPPER RADIATOR HOSE AND DISCONNECTED THE POWER STEERING PUMP FROM THE BRACKET WITHOUT COMPLETELY REMOVING IT. NEXT WE REMOVED THE LOWER RADIATOR HOSE, FOLLOWED BY THE A/C COMPRESSOR DRIVE BELT. AFTER GETTING THE TRUCK BACK ON THE GROUND, WE REMOVED THE FAN AND THE FAN SHROUD. NOW NORMALLY YOU DON'T HAVE TO REMOVE THE RADIATOR TO DO THIS JOB, BUT THERE'S A REASON WE'RE GIVING OURSELVES A LITTLE BIT OF EXTRA ROOM. A COUPLE OF BOLTS, IT COMES OUT EASILY ANYWAY. AND WITH THE FAN OUT OF THE WAY, WE CAN REMOVE THE TWO PULLEYS THAT WERE BEHIND IT, FOLLOWED BY THE PLASTIC COVER THAT'S OVER THE UPPER PORTION OF THE TIMING BELT. THEN WE GOT THE FAN BRACKET OUT OF THE WAY. NOW HERE'S THE REASON WHY WE REMOVED THE RADIATOR. TYPICALLY YOU HAVE TO HAVE A SPECIAL TOOL TO HOLD THE CRANK SHAFT FROM ROTATING TO REMOVE THE HARMONIC BALANCER, BUT OUR POWERFUL HALF INCH MATCO GUN GOT THE JOB DONE FOR US AND SAVED US FROM BUYING THAT SPECIAL TOOL. AFTER THAT, WE REMOVED THE AIR CONDITIONING COMPRESSOR BRACKET. THAT GAVE US ACCESS TO THE TIMING BELT TENSIONER THAT WE'RE GONNA REPLACE. THEN WE LOOSELY REINSTALLED THE HARMONIC BALANCER TO SET THE ENGINE AT TOP DEAD CENTER, VERIFYING THAT OUR CAMS WERE ALSO IN THE CORRECT POSITION AND THEY WERE LINED RIGHT UP. THEN WE REMOVED THE TIMING BELT TENSIONER, WHICH WE'RE REPLACING, FOLLOWED BY THE WASHER THAT'S BEHIND THE HARMONIC BALANCER NOTING WHICH SIDE FACES THE ENGINE. THEN WE CAN SLIP THE TIMING BELT OFF. (KEVIN)>> HEY, WELCOME BACK TO TRUCKS. 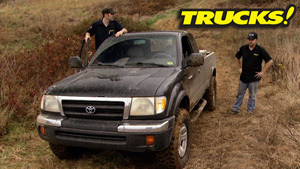 WELL TODAY WE'RE WORKING ON A BRAND NEW PROJECT, OUR TOYOTA TACOMA HERE. BUT BEFORE WE CAN TAKE IT OUT AND SEE WHAT IT'LL DO IN STOCK TRIM, IT'S KINDA MILED UP AND WE'VE GOT SOME MAINTENANCE TO DO. (RYAN)>> NOW A COUPLE OF THE GUYS WE GO WHEELING WITH EVERY NOW AND THEN RUN ACC TOYOTA TRUCK AND LAND CRUISER OUT OF ATLANTA, GEORGIA. AND SINCE THEY ONLY WORK ON TOYOTAS FROM MAINTENANCE TO RESTORATIONS AND THEY'RE THE EXPERTS, WE WENT TO THEM FOR OUR TIMING BELT PARTS. HERE'S WHAT THEY SENT US. THESE ARE OEM QUALITY REPLACEMENT PARTS. WE'VE GOT A NEW TIMING BELT, TIMING BELT TENSIONER, IDLE BEARINGS, WATER PUMP, THERMOSTAT, AND THE GASKETS NEEDED. THEY ALSO SENT US A CAM SHAFT AND A CRANK SHAFT SEAL. BUT LUCKILY FOR US, WE DIDN'T FIND ANY OIL LEAKS. NOW LIKE WE SHOWED YOU EARLIER, WE HAVE SOME WORN STEERING COMPONENTS. SO WE PICKED UP A SET OF INNER AND OUTER TIE RODS. AND SINCE DOING A TIMING BELT'S A PRETTY MAJOR SERVICE, IT ONLY MAKES SENSE TO GO ALL THE WAY AND PICK UP A OIL FILTER, AIR FILTER, DRIVE BELTS, AND SPARK PLUGS. NOW THE AIR FILTER IS THE NEW SYNTHAMAX OIL LESS AIR FILTER FROM AIRAID, AND IT DROPS RIGHT IN THE FACTORY LOCATION. WE ALSO PICKED UP A SET OF ETHREE DIAMOND FIRE SPARK PLUGS. SO OUR NEW TO US TRUCK IS OFF TO A NICE, CLEAN START. NOW WE'RE REPLACING BOTH IDLER PULLEYS, OR BEARINGS. YOU DON'T WANT TO SKIMP HERE AND REUSE THE ORIGINAL AND END UP WITH A BAD OR FAILED BEARING A FEW THOUSAND MILES DOWN THE ROAD. YOU'LL JUST END UP HAVING TO DO THIS JOB AGAIN. SINCE WE'RE GOING THIS FAR INTO IT, IT ONLY MAKES SENSE TO ALSO REPLACE THE THERMOSTAT AND WATER PUMP. NOW PART OF THIS JOB INVOLVES REMOVING THE DIP STICK. SO GO AHEAD AND PLUG THE EMPTY HOLE SO YOU DON'T GET COOLANT IN THE OIL PAN DURING THE REMOVAL OF THE WATER PUMP. 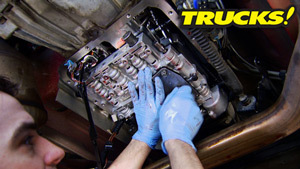 AFTER INSTALLING A NEW GASKET, SIMPLY INSTALL THE WATER PUMP AND TORQUE IT DOWN. THEN WE CAN REINSTALL OUR NEW IDLER BEARINGS. NOW TO MAKE THIS JOB A LITTLE BIT LESS INTIMIDATING AND A LITTLE EASIER FOR THE DO IT YOURSELFER, THE TIMING BELT EVEN HAS MARKS ON IT TO HELP YOU LINE IT UP WITH THE CAM SHAFT AND CRANK SHAFT SPROCKETS. AND AS LONG AS THE CRANK SHAFT AND THE CAM SHAFT DON'T ROTATE, THIS WILL ENSURE THAT THE ENGINE IS TIMED CORRECTLY. NOW IF YOU'RE REUSING THE TIMING BELT TENSIONER, YOU NEED TO COMPRESS THE PLUNGER IN A VICE AND PIN IT UNTIL IT'S INSTALLED. BUT SINCE WE'VE GOT A NEW ONE FROM ACC, IT'S ALL READY TO GO. 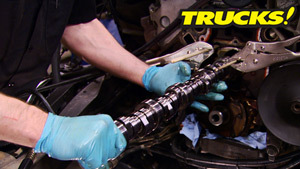 (KEVIN)>> SO WE GOT THE UNIVERSAL JOINT ON THE BACK PART OF THE TWO PIECE SHAFT CHANGED OUT. AND IT'S KINDA BORING AND STRAIGHT FORWARD, SO WE DIDN'T WANT TO BORE YOU WITH THE SWAP OUT BUT I DID WANT TO SHOW YOU THE DAMAGE TO THE ONE WE REPLACED. YOU SEE THESE RIDGES IN THE CROSS? THAT'S CALLED A BURNELLING EFFECT, AND IT'S FROM THE NEEDLE BEARINGS NOT ROTATING PROPERLY OR NOT AT ALL IN THIS CASE. NOW THAT IS GONNA CAUSE A VIBRATION AND EVENTUALLY THAT WHOLE JOINT IS GONNA FAIL. SO IT REALLY NEEDED TO BE REPLACED. NOW WHAT WE DID SAVE TO SHOW YOU IS THE CARRIER BEARING BEING REPLACED. NOW THIS ONE OBVIOUSLY IS SLOPPY AND THAT'S ONLY GONNA GET WORSE. SO THIS LITTLE BIT OF MAINTENANCE IS NOT GONNA COST YOU THAT MUCH AND IT'S NOT REALLY GONNA TAKE YOU THAT MUCH TIME. BUT THIS'LL MAKE THE DIFFERENCE IN YOUR TRUCK FEELING SLOPPY AND WORN OUT AND FEELING BRAND NEW. EVERY ONCE IN A WHILE, NECESSARY MAINTENANCE IS ACTUALLY PRETTY EASY, THIS IS STRAIGHT FORWARD. BUT BEFORE WE INSTALL THE NEW BEARING, THE OLD ONE'S GOTTA COME OFF. JUST MAKE SURE THAT YOU PUT EVERYTHING BACK LIKE IT CAME APART. DON'T FORGET YOUR FINAL STEP OF LOCKING IN THE RETAINER NUT. NOW BASIC MAINTENANCE LIKE THIS GIVES YOU THE OPPORTUNITY TO INSPECT THE OTHER COMPONENTS AND TAKE CARE OF THINGS THAT YOU MAY HAVE NORMALLY MISSED, SUCH AS GREASE IN THE OTHER UJOINTS THAT WERE STILL OKAY. (KEVIN)>> HEY, WELCOME BACK. WELL WITH THE MAINTENANCE OUT OF THE WAY, WE DECIDED TO TAKE THE TACOMA UP HERE TO WOOLEY'S OFF ROAD AND SEE WHAT IT'LL DO IN STOCK FORM. AND ON A SLOPPY DAY LIKE THIS ONE, IT'S A GOOD THING WE'VE GOT THESE MICKEY THOMPSON MUD TERRAINS. WE'RE GONNA NEED'EM! (KEVIN)>> IT HAD RAINED THE NIGHT BEFORE, WHICH MADE THE TRAILS A LITTLE BIT UNPREDICTABLE. THESE RAILS ARE NOTHING MORE THAN A STEP, AND I'M SURE WE'RE GONNA FIND OUT WHY SOMETIME TODAY. NOW TAKING A BASICALLY STOCK TRUCK ON AGGRESSIVE TRAILS WAS AN INTERESTING CHALLENGE. BUT WHEEL SPEED, IT WAS OUR FRIEND MOST OF THE TIME. (KEVIN)>> OKAY, WE GOT REALLY LUCKY. WE HIT THE CONTROL ARM AND NOT THE RADIATOR WITH THAT FACTORY SKID PLATE GONE, BUT FROM THIS POINT FORWARD WE'RE NOT GONNA PUSH OUR LUCK. I'M GONNA WALK UP HERE AND SPOT A LITTLE BIT, LET RYAN PICK OUT A BETTER LINE. 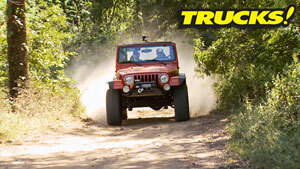 (RYAN)>> NOW RUNNING A SET OF MUD TERRAIN TIRES IS A TRADE OFF. THEY'RE USUALLY A LITTLE BIT LOUDER RUNNING DOWN THE ROAD AT HIGHWAY SPEEDS. BUT IF YOU'RE ACTUALLY GONNA USE YOUR TRUCK OFF ROAD, WELL IT'S WELL WORTH IT. AND DESPITE THE LIMITED WHEEL TRAVEL YOU GET WITH AN INDEPENDENT FRONT SUSPENSION, WELL IT DOES HAVE ITS BENEFITS, LIKE BEING ABLE TO SOAK UP THE BUMPS AND WHOOPS AT SPEED A LOT BETTER THAN ITS SOLID AXLE COUNTERPARTS. AND WHILE OUR TRUCK HANDLED THE BUMPS, OUR CAMERA GEAR DIDN'T. CAMERA GEAR! THAT STUFF'S EXPENSIVE ISN'T IT? (RYAN)>> AND WITH OUR CAMERA GEAR BACK IN OUR POSSESSION, WE THOUGHT WE'D HEAD TOWARDS THE MORE AGGRESSIVE TRAIL, WE JUST DIDN'T KNOW HOW THAT WAS GONNA WORK OUT. (KEVIN)>> WHAT DID WE FIND? 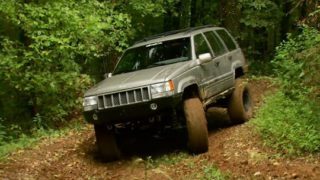 (RYAN)>> ONCE YOU GET UP ON THAT ROCK WITH YOUR RIGHT FRONT, TRY TO HEAD PASSENGER A LITTLE BIT. NOPE, PASSENGER, YOU GOT IT! ALRIGHT, HOLD UP, HOLD UP! OH DID I HEAR THAT STEP SCRAPPING? OH YEAH, YEAH, WE'VE GOT AN INTERFERENCE PROBLEM WITH THIS STEP AND THIS LARGE CHUNK OF ROCK THAT GOD PUT HERE. 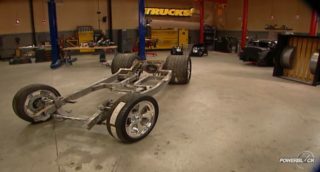 (KEVIN)>> SUSPENSION DROOP TEST IS COMPLETE. AFTER WE PROVED THE TACOMA COULD FLY, WE WANTED TO SEE IF IT COULD SWIM. (RYAN)>> KEVIN'S WASHING THE TRUCK WHEN WE GET BACK TO THE SHOP, NO DOUBT ABOUT IT. NOW WE TOLD YOU RIGHT UP FRONT THAT WE DIDN'T REALLY CARE FOR THE PREVIOUS OWNER'S EXHAUST SYSTEM. THE MUFFLER JUST SOUNDS BAD AND THE EXHAUST TIPS RATTLE AROUND ON THE FRAME AND THE LEAF SPRINGS. BUT IF WE CAN LOOK PAST THAT, WE SEE A TRUCK THAT'S A SOLID FOUNDATION. THIS THING'S TOUGH AS NAILS. AND DESPITE ITS LIMITATIONS IN STOCK FORM, THIS IS A GREAT TRUCK TO START WITH. (RYAN)>> HEY GUYS, WELCOME BACK TO TRUCKS. WELL WE'RE STILL DOWN HERE AT WOOLEY'S HAVING A GREAT TIME DESPITE OUR TACOMA'S KINDA MODERATE HORSEPOWER LEVEL. 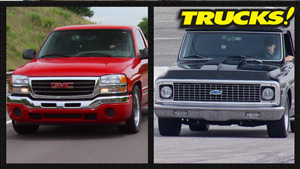 (KEVIN)>> BUT, ALTHOUGH IT'S NO DAS BRONCO, IT'S NOT ABOUT BRUTE HORSEPOWER AND TORQUE WITH THESE TRUCKS. IT'S MORE ABOUT GEARING AND UTILIZING THE FACTORY COMPONENTS THAT ARE ALREADY THERE IN PLACE. AND THIS TRUCK DOES JUST FINE ALL BY ITSELF. (RYAN)>> LOW RANGE, FIRST GEAR, I'LL MEET YOU AT THE TOP OF THE HILL. (RYAN)>> THERE'S A RESTAURANT UP THERE. I'LL GO AHEAD AND PLACE AN ORDER, WHAT DO YOU WANT? (RYAN)>> SANDWICH, A COLD DRINK? (KEVIN)>> A COLD DRINK, I'LL TAKE A COKE. (RYAN)>> ALRIGHT, I THINK I LEFT MY WALLET AT THE BOTTOM OF THE HILL THOUGH. I'LL JUST WALK BACK AND GET IT HERE. NOW OUT ON THE PAVEMENT, THIS TRUCK IS JUST LIKE MOST MODERN PICK UPS. IT RIDES GOOD, IT'S COMFORTABLE, AND IT MAKES DECENT POWER. AND WITH THE VSIX MATED TO THE FIVE SPEED MANUAL, IT'S ACTUALLY PRETTY FUN TO DRIVE. NOW THIS VSIX HAPPENS TO BE A NONINTERFERENCE STYLE ENGINE, MEANING IF THE TIMING BELT BROKE, THE ENGINE WOULD JUST DIE AND YOU'D COAST TO THE SIDE OF THE ROAD. BUT IF YOU'VE GOT AN INTERFERENCE STYLE ENGINE AND THE TIMING BELT BREAKS, OPEN VALVES MEET PISTONS AND REALLY BAD THINGS HAPPEN. SO THAT'S WHY IT'S REALLY IMPORTANT TO FOLLOW THE RECOMMENDED SERVICE INTERVALS. NOW FOR A BASICALLY STOCK TRUCK, THIS THING DID GREAT. NOW WANTED TO BE ROUGH ON IT AND SEE WHAT IT COULD HANDLE, BUT WE DIDN'T WANT TO BEND IT OR BREAK IT RIGHT OUT OF THE GATE. I THINK WE PROVED THAT THIS IS A TOUGH PICK UP TRUCK AND A WORTHY ONE TO BUILD OFF OF. NOW WE DO WANT TO MAKE SOME CHANGES. WE WANT TO GET THE TRUCK SITTING UP HIGHER, WE NEED SOME TALLER TIRES, AND WE COULD USE A LITTLE MORE TRACTION OUT OF THAT FRONT AXLE. (KEVIN)>> WE ALSO WANTED TO GET RID OF THESE FLIMSY TUBE STEPS AND TRADE THEM FOR SOME ACTUAL ROCK SLIDERS THAT'D GIVE US REAL BODY PROTECTION. NOW THE PREVIOUS OWNER OF THIS TRUCK, WELL HE WAS A TURKEY HUNTER. SO WE THOUGHT ABOUT PAYING TRIBUTE TO THAT AND CALLING IT THE TURKEY TACO OR THE TOM COMA. THAT'S A LITTLE ON THE HOKEY SIDE. 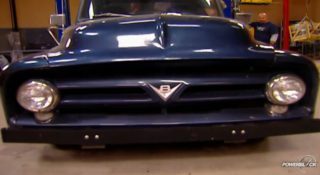 SO SINCE IT'S AN EXTENDED CAB TRUCK, WE WANT TO CALL IT PROJECT EXTENDED COMA. HOPEFULLY THAT'S GOT A LITTLE MORE LEGS AND DOESN'T RUFFLE ANYBODY'S FEATHERS, THAT'S BAD! (RYAN)>> HEY GUYS, IF YOU'RE LOOKING TO KEEP AN EYE ON YOUR VEHICLE'S PERFORMANCE, CHECK OUT THE CS AND CTS MONITORS FROM EDGE PRODUCTS. THIS IS A COMPREHENSIVE GAUGE DISPLAY AND IT WORKS ON ALL '96 AND NEWER OBD TWO EQUIPPED VEHICLES, AND IT CAN DISPLAY A VARIETY OF DIFFERENT VEHICLE PARAMETERS. IT'S ALSO GOT SCAN TOOL CAPABILITIES, AND YOU CAN RUN PERFORMANCE TESTS WITH IT LIKE 0 TO 60 AND QUARTER MILE TIMES. A SIMPLE CONNECTION TO YOUR OBD TWO PORT AND YOU'RE UP AND RUNNING. YOU CAN EVEN CUSTOMIZE THE DISPLAY USING THE EDGE PRODUCTS MY STYLE SOFTWARE. HEY GUYS, THANKS FOR WATCHING TRUCKS. IF YOU'VE GOT ANY QUESTIONS ABOUT ANY OF THIS STUFF, GO TO POWERBLOCK TV DOT COM. SEE YOU NEXT WEEK!